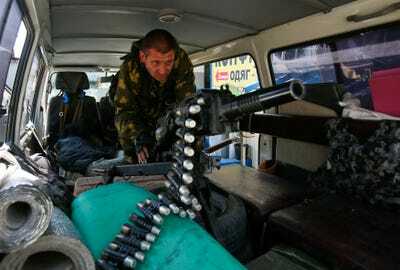 Maxim Zmeyev/REUTERSRussian-backed Ukrainian separatists pose aboard a mobile anti-aircraft battery. As Russian military supplies continue to pour into Ukraine, it becomes harder by the day for Putin to deny that Moscow is providing arms to the separatists. Since the conflict in eastern Ukraine began last spring, the separatists have become increasingly well equipped and capable of resisting the Ukrainian military. Some of the supplies the separatists use have been captured or looted from governmental personnel. However, a number of pictures prove that the separatists are armed with Russian weapons that have extremely rarely, if ever, been exported outside of Russia. The Armament Research Services has released their third report on the arms and munitions being used by both the Ukrainian government and the rebels in the ongoing conflict. Complete with photographic evidence, it is clear that Moscow has been covertly supplying an assortment of older Soviet weaponry along with recently introduced Russian equipment to the separatists. Self-loading rifles are a popular weapon of the separatist forces. Aside from a number of AK rifle varieties, the separatists also sport a host of recreation hunting and sport firearms. In one case, a separatist was documented using VSS rifles. These are Russian-made marksman rifles that are analogous to those used by Russian forces during the annexation of Crimea. Light machine guns make up some of the most common weaponry of the separatists. 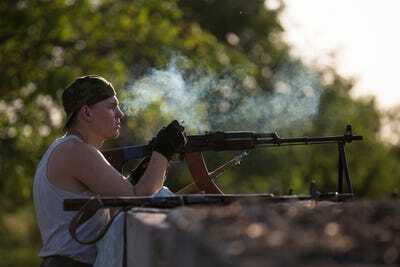 The light machine guns utilized by the separatists include weaponry used by the Ukrainian military, as well as Russian-produced guns that are not in service with Ukrainian forces. The PKP 'Pecheneg' light machine gun, for example, is not used by the Ukrainian forces and has been exported outside of Russia in only minimal quantities. The use of shotguns and bolt-action rifles have been documented as being used by separatists who are incapable of accessing better quality small arms. Some older bolt-action sporting rifles have also been documented being used by the separatists. These rifles are in some cases antiques, dating to use with the Russian infantry from World War II or earlier. Russian crafted handguns dominate as the principal choice for the separatists. 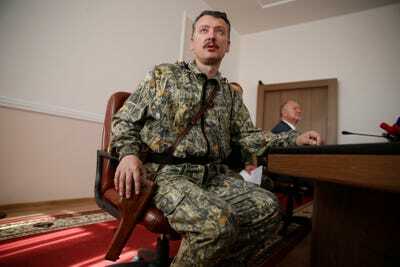 Igor 'Strelkov' Girkin, the former leader of the Donbass People's Militia and governor of Luhansk, has had photos carefully taken of him handling a Russian Stechkin APS. The APS was originally designed for Russian vehicle, artillery, and RPG crews. Anti-material rifles are light weapons that have been designed for use against military equipment rather than use against people. The anti-material rifles being used by the separatists include out dated and obsolete Soviet World War II era anti-tank rifles (the PTRS-41) and the equally old PTRD. 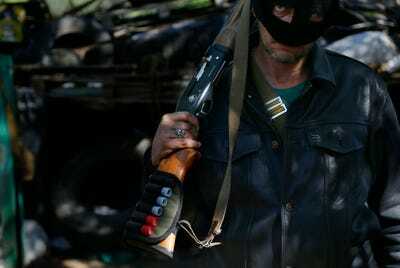 In at least one case, separatists were found to be using the Russian ASVK anti-material rifle. The ASVK has only been introduced into the Russian military within the past two years and none have been known to have been exported. 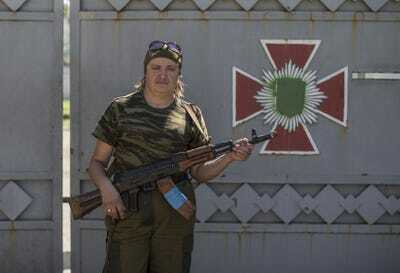 The origins of the heavy machine guns used by the separatists in Ukraine is murky. Both the Ukrainian government and the separatists use similar weaponry, and it is possible that the rebels salvaged the weaponry from Ukrainian military vehicles. In general, the heavy machine guns used by the separatists are fairly old. Most date back to the Soviet Union, while the Maxim PM1910 may date back as early as the Russian Empire. The PM1910 was likely looted from a museum or a historical re-enactment community. Like the heavy machine guns, both the Ukrainian government and the separatists have used the same variety of underbarrel and automatic grenade launchers. 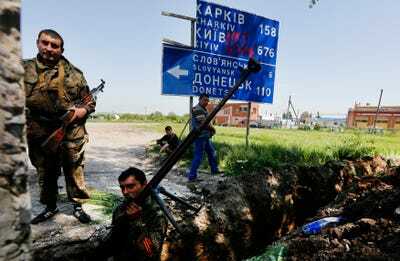 In the case of eastern Ukraine, it is impossible to determine whether the grenade launchers were captured from Ukrainian soldiers or were provided to the separatists from Russia. The separatists have a wide variety of portable anti-tank systems. For the most part, the rebels seem to prefer the use of rocket propelled grenades of the legacy RPG-7 launcher. However, the rebels have also used more modern RPG-18 and RPG-22 systems. 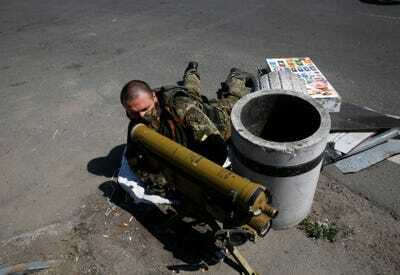 Notably, separatists have also been documented using MRO-A disposable incendiary rocket launcher systems. These systems are not known to have ever been exported outside of Russia. 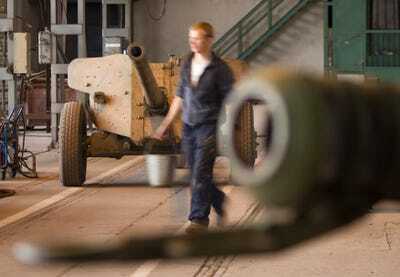 Used alongside the portable anti-tank systems are a mixture of Soviet-era recoilless guns and mortars. These weapons are generally dated. There is no direct evidence that these weapons have been provided by the Russians to the separatists, as both the Ukrainian government and the separatists make use of similar systems. 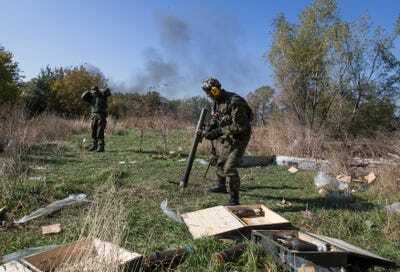 Anti-tank guided weapons (ATGWs) have been documented in large numbers in the hands of the separatists. The majority of these ATGWs are used by both the Ukrainian military and the separatists. However, the separatists have also been documented using the 9K135 Kornet ATGW system. The Kornet is not in service with the Ukrainian military, although it is used by the Russians. Based on discarded components found on the battlefield, the missiles used for the Kornet were produced in Russia in 2007. 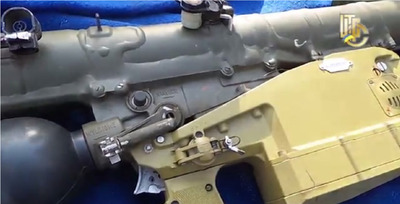 Russia has exported the Kornet to several other states around the world, and militants in Gaza, Iraq, Libya, and Syria have all been documented using the weapon system. A Polish PPZR Grom missile tube outfitted with a Russian grip. Separatist forces have a large array of man-portable air defence systems (MANPADs) and anti-aircraft guns. By and large, the MANPADs that the separatists have been using are of the same make as what is within the Ukrainian arsenal. 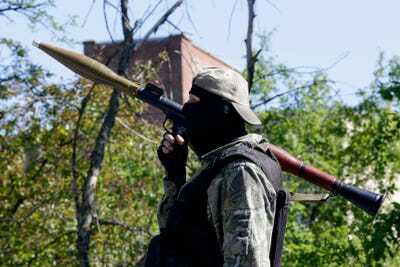 There have been reports of separatists seizing supplies of MANPADs from the Ukrainian military early in the conflict. However, in one notable exception, Polish PPZR Grom MANPADs were captured from the separatists. One of the only countries that Poland ever exported the PPZR to was Georgia. In 2008, during Russia's invasion of the country, Russia was known to have captured some of the Polish-supplied PPZRs. It is likely that those captured weapons are now being funneled to the separatists. Aside from MANPADs, the separatists also have a varied arsenal of anti-aircraft guns. At times, these weapons have also been turned against Ukrainian military personnel and light vehicles. 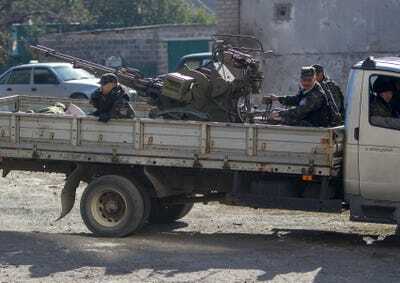 The anti-aircraft guns that the separatists, and to a smaller extent the Ukrainian government, have been utilising are heavy machine guns mounted in one, two, and four barrel configurations. 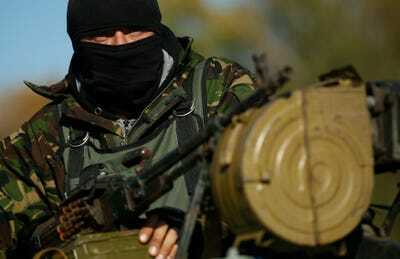 The separatists likely captured the anti-aircraft weapons from the Ukrainian military. Artillery has become one of the primary methods of engagement between the Ukrainian government and separatist fighters. Indiscriminate shelling by both sides has led to wide spread destruction throughout portions of eastern Ukraine, along with significant civilian casualties. Both the Ukrainian government and the separatists use the same varieties of Soviet and Russian artillery in their engagements. As such, it is difficult to determine whether the rebels had received these arms directly from Russia or had looted them from the Ukrainian military. 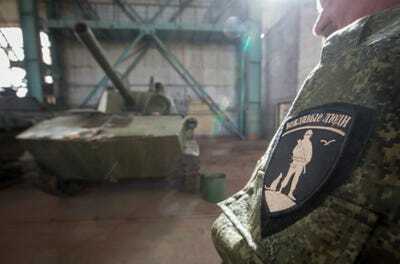 Both Ukrainian governmental forces and the separatists have placed high value on the use of main battle tanks. In many cases, the separatists are utilising captured Ukrainian tanks, or tanks of the same model provided by the Russians. 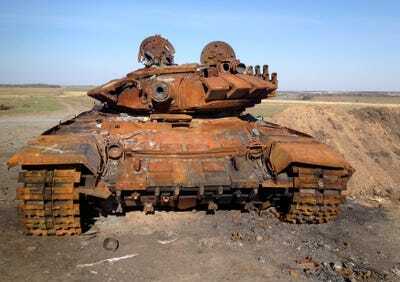 However, the separatists have also used Russian tanks that are not known to have ever been exported outside of the country such as the T-72B and T-72BA. Notably, the separatists have also deployed the T-72B3, the latest T-72 model in the Russian service. The tank is not known to have been exported and it was just introduced into service in 2013 indicating Russian involvement in the crisis. Infantry fighting vehicles (IFVs) and armoured personnel carriers (APCs) are the most documented type of armoured fighting vehicle in use in Ukraine. Both IFVs and APCs are designed to function as armoured troop carriers, with IFVs being differentiated as having an armament of 20 mm in calibre or larger for offensive capabilities. Although the separatists and the Ukrainians use many of the same IFVs and APCs, separatists have been documented using Russian-variants of APCs in the Ukrainian arsenal that were designed in the late 1990s and early 2000s. 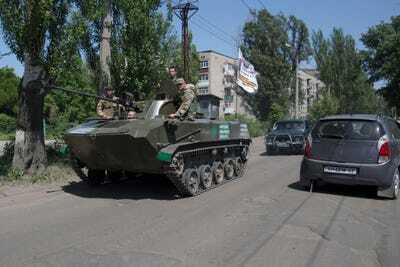 Strikingly, separatists have also been documented driving the BTR-82AM IFV. This model was inducted into Russian service in 2013 and is not known to have ever been exported. Both the Ukrainians and the separatists have utilized the same variants of self-propelled artillery. Given the models and the Ukrainian numerical advantage in fielding these weapon types, the separatists likely looted or captured their self-propelled artillery. Much like self-propelled artillery, the Ukrainian government has used self-propelled rocket artillery significantly more than the separatists have. 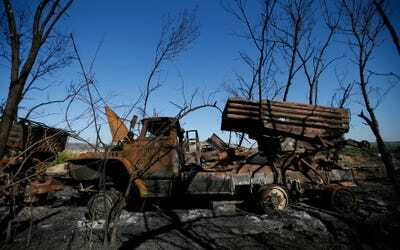 In almost every occasion that the separatists have used rocket artillery, the weapons systems used were identical to what is in the arsenal of the Ukrainian government. Although the separatists have generally used the 9K51 Grad rocket system, which may or may not have been looted from Ukrainian forces, the rebels also have used a 9K51M Tornado-G. This is a modernized Grad system that was likely supplied by the Russians. However, documented proof of the separatist's using this system is limited. 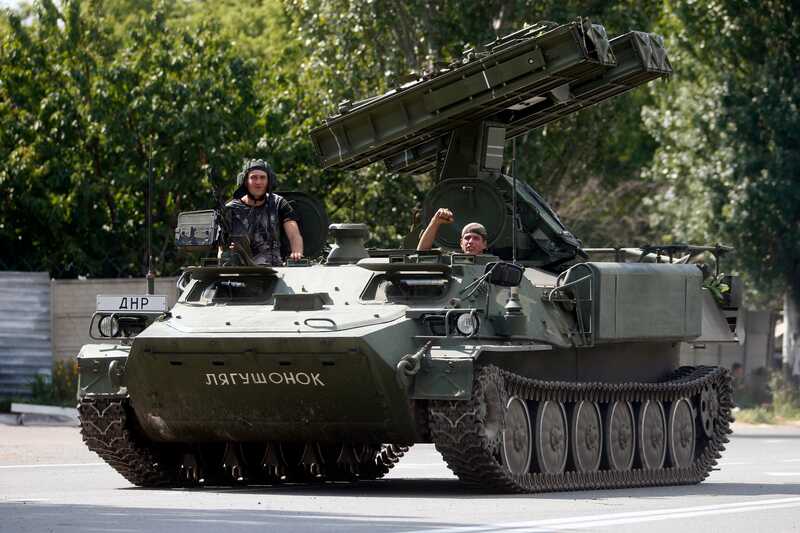 In addition to MANPADs, the separatists have made frequent use of self-propelled air defence systems. These systems seek to negate the Ukrainian government's complete aerial dominance. The systems have proved effective at downing Ukrainian aircraft and were also involved in the tragic downing of Malaysia Airlines Flight MH17. 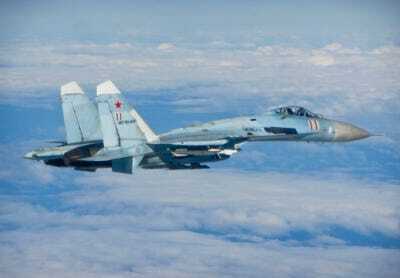 The rebels in general have used air defence systems that are present in the Ukrainian military. However, the separatists have also utilized Russian Pantsir-S1 and Buk missile systems that were not in the Ukrainian arsenal.